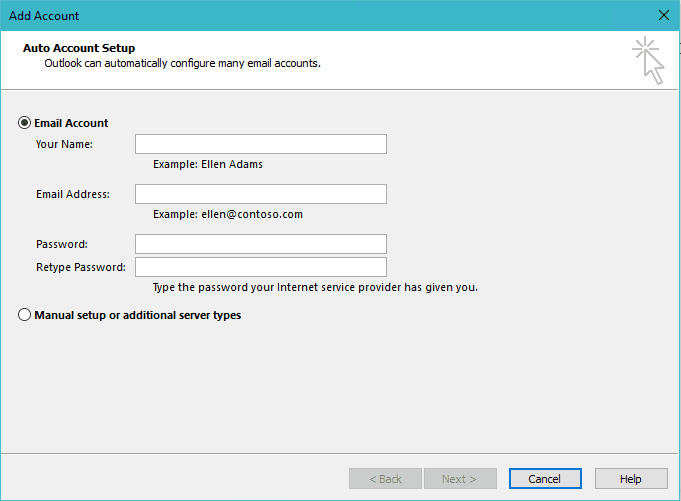 The newest builds of Outlook 2016 have a new, simplified account dialog. It’s definitely simple and easy to use (although a little slow IMHO). Just type in your email address and wait for Outlook to find the account and ask for your password. It’s a couple more steps if you want to or need to create the account manually; you need to enter your email address, expand Advanced to choose manual setup, wait for Outlook to look for the account information then choose the account type you want to create. If you use a POP account, the new dialog makes setting up the account with an existing Outlook Data File (.pst) much file easier. If the pst file is in the Outlook Files folder and the name is your email address, Outlook uses it instead of creating a new pst file. You don't have to select the .pst, Outlook picks it up automatically. If you leave mail on the POP server, Outlook also appears to do a much better job at not downloading the old mail. Honestly, in the end, for most of us, it’s just a prettier version of the old dialog, but some people prefer the older, familiar dialog. I think the old dialog is faster, as you don't need to wait for Outlook to search for accounts, but POP users definitely benefit from the new dialog. You can turn off the simplified version and revert to the older Add Account dialog by editing the registry. While this is not necessary for most situations, it is necessary to set this key if you want to create a send-only account. This will allow you to create an account with "mail" as the incoming server name and the actual SMTP server name in outgoing. As always, if the keys don’t exist, you’ll need to create them. Thank you for the registry keys. Giant time saver. And the old interface is always available via Control Panel and "Mail"
One thing I noticed is using the old Account wizard, when adding a POP account the browse button doesn't work when trying to browse for an old data file. Yeah, that's been a problem for a while, before the new design. y experience is that if the pst name is the email address and its in the default location, it should pick it up.